Their story is straight out of a script: irrepressible, spunky heroine meets taciturn, smoldering hero. But these two refuse to be typecast, and when the embers of an old love are stoked, someone is bound to get burned. 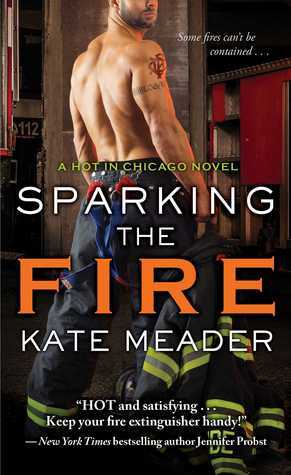 Ms. Meader does not disappoint in this installment of her Hot in Chicago series as the oldest and last Dempsey standing succumbs to the call of love. SPARKING THE FIRE has got everything you love in a romance: raw passion, sweet and tender moments, witty and entertaining dialogue and lovable characters, and is just too good to pass on. Right now, I’m torn between excitement at finally reading this book after waiting for so long and sadness that this is it: the end. Two strangers in a bar, several night of passion and forever memories. Five years later they meet again, this time as a famous Hollywood actress and the man standing in the way of her achieving her comeback. Molly Cade is not going to let anyone stop her from getting what she wants, not even the man that has haunted her dreams for so long and Wyatt Fox is just as determined to protect his family, which makes for fun times when the sparks begin to fly! I loved these two so much. The passion between them, their emotional bond, the ways they completed each other, even how they fought, I loved it all. Molly may have been knocked down, but she’s definitely not out. She’s smart, beautiful and down to earth and fit right in with the Dempseys. Wyatt is a loner by nature and by choice, but Molly was exactly what he needed to bring him out of his shell and forge stronger connections with his siblings and his confession of how she changed the direction of his life five years ago was an ‘awww’ moment for me. As a bonus, catching up with the rest of the family was so enjoyable. Part of the fun in this book is the way the siblings interact and have each other’s backs, but are quick with the tough love when needed. If you haven’t read anything by this author, this series is a perfect place to start and TBH, her entire back-list is worth your time. This series as a whole is a must-read, with every book as good as the next and I recommend it for the keeper shelf. I’m sure I speak for many when I wonder if Ms. Meader can, I don’t know, scrounge up a lost cousin from somewhere or perhaps a wedding in the family, to give us another chance with these characters. The Librarian – Blog Talk Radio Author’s on the Air – Interview Only – Listen Live at 7:30 pm ET!